Kevin is an award-winning theater actor. Theatre credits include MacBeth (MacBeth,) Tuesdays With Morrie (Mitch Albom,) The Nerd (Rick Steadman,) Dracula the Musical (Dracula,) and innumerable others. 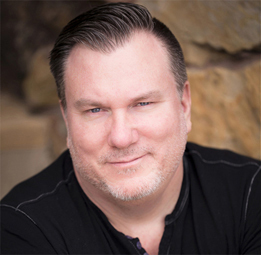 Kevin has trained with some of the most effective acting coaches in the industry: Dave Walsh, Pat Fraley, Jeff Howell, Tom PInto, Susan Berkley, Hilary Huber, J. Michael Collins and Rodney Saulsberry . Kevin Kilpatrick works from his own state of the art studio. He voices from a state of the art, custom built sound booth from Vocalbooth.com. The booth’s exterior measures 5 ft by 7 ft.; the rectangular shape chosen to reduce the amount of reverberant “bounce” you would get compared to a square booth. The booth is treated with top of the line acoustical products to insure pristine sound. Kevin’s particular booth is similar to ones built for Lady Gaga, Donny Osmond and Mariah Carey. He voices with the Manley Reference microphone, powered and processed with an Avalon VT 737 vacuum tube pre-amp. For optional sounds, Kevin also uses the Sennheiser MKH416 Shotgun Mic and Rupert Neve Portico 5017 Mic Pre. Voice files can be sent via email or FTP in the format of your choice – MP3, WAV, AIFF. Kevin uses Source-Connect for live recording sessions. Skype, Zoom or Phone patch directed sessions also available. Kevin is also a skilled producer. On a hearty Apple Mac Pro, Kevin uses the latest edition Pro Tools software for audio editing, equipped with over 100 audio sweetening plugins. For any sound design needs, Kevin holds usage rights to the Firstcom Music library, an industry leader providing production music for film, broadcast, multimedia and corporate productions. Thousands of sound effects are also available. With a stellar resume’ to his credit, Kevin is also available for your live announcer event. From concerts to corporate events, award shows to pageants, Kevin is quick on his feet and adaptable to any live announce occasion. Kevin is also passionate about sports, having been a play-by-play announcer for NCAA basketball, State Championship HS Football and The Babe Ruth Baseball World Series. Kevin still actively plays sports, including golf, tennis and in an adult baseball league. His favorite sports team is the St. Louis Cardinals.